Robotics and artificial intelligence could affect almost a third of UK jobs by the 2030s, according to a study. "Jobs where you've got more of a human touch, like health and education," would be safer, he said. The use of robots in the workplace is rising with workers in some sectors already facing up to the potential challenges. "You can already see on the railways that all these strikes are not unrelated to the move towards driverless trains," Mr Hawksworth said. In the future, truck drivers might "job share" with a self-driving lorry, although even that might ultimately be under threat, he said. "Ultimately, people are going to have to be more adaptable," he added. The government should help by providing lower-skill workers with more training in the next 10 to 20 years, the report said. However, it also concluded that gains in productivity from robots and Artificial Intelligence (AI) would boost the economy. "In many ways automation is a good thing. It's going to boost productivity, a big problem for the UK recently, and increase incomes... which will increase demand for human jobs in other areas," Mr Hawksworth said. 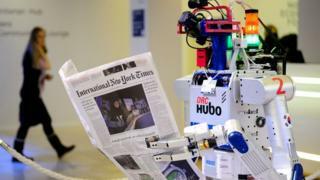 The UK is near record-low levels of unemployment and so outsourcing more repetitive tasks to robots could free up people to do more valuable work, the report found. Beyond 'Brogrammers': Can AI create a meritocracy?